Opening-day school enrollment in the Paynesville Area School District was 1,074 this year, down 11 from last year's opening-day total of 1,085. This decline was due mainly to the district graduating 95 seniors last spring, replaced by only 83 kindergarten students this fall. Other than this grauduation loss of 12, district enrollment gained one student this fall. Opening-day enrollment (1,074) did exceed the district's projections for this fall (1,070). This is the 12th straight year of declining enrollment in the district. 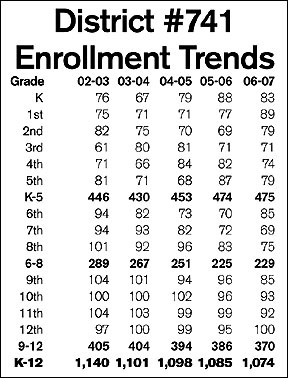 The last time that opening-day enrollment increased in Paynesville was 1994-95, when it increased by 27 students with district enrollment reaching a peak of 1,429. During the past 12 years, the district enrollment has dropped from 1,429 to 1,074, a decline of 355 students. "Twelve years in a row we've been experiencing declining enrollment," said superintendent Todd Burlingame. "The nice thing is it's not a large number (this year)." Smaller enrollment losses are "easier to absorb," said Burlingame. Still, almost all state funding - from capital dollars to the new gifted and talented aid -is determined by formulas, which invariably include student enrollment. When it comes to school funding and budgeting, "kids equal dollars,"�said Burlingame. And while the district's enrollment has declined over the past 12 years, its expenses - staff salaries, fuel costs, etc.�- have increased, added Burlingame. After two years of static funding in 2003-04 and 2004-05, school districts did receive an increase of four percent in basic state aid per pupil unit each of the last two years. Basic state aid increased to $4,783 per pupil unit in 2005-06 and to $4,974 per pupil unit in 2006-07. This aid increase - along with small enrollment losses the past couple years - enabled the district to increase its school budget by $7,800 for the 2006-07 school year, the first time the budget increased after five years of budget cuts. With additional student enrollment losses looming, more budget cuts are planned. The three largest grades in the district are the sophomore, junior, and senior classes, which have 93, 92, and 100 students respectively. If the district continues to enroll 80 students in kindergarten, this means a loss of 45 students over the next three years as these larger graduating classes are replaced by smaller kindergarten classes. The district planned to cut $150,000 from the budget for 2007-08, said Burlingame, but, depending on the state of district finances as revealed by the annual audit, that full amount should not be needed. The district could have a fund balance over $1 million as of July 1, 2006, said Burlingame of the pre-audited financial numbers. A healthy fund balance for the district would be six to eight percent of unreserved dollars in its general fund ($600,000 to $800,000), said Burlingame. One good sign for the district is that it has 89 students in first grade this year and 83 students in kindergarten, meaning it has averaged enrolling 86 students the past two years. In the seven years from 1998-99 to 2004-05, the district enrolled more than 80 students in kindergarten only twice. If the district continues to enroll 80 students or so in kindergarten, then the total district enrollment could plateau at 1,040 students in three years (once the three largest classes of sophomores, juniors, and seniors graduate). As these classes graduate, further enrollment losses will occur in the high school. At the elementary school, enrollment actually increased by one (from 474 to 475), and at the middle school it increased by four (from 225 to 229). In the high school, however, enrollment dropped 16 students (from 386 to 370), after dropping by eight the previous year. Next year, the high school could lose another 25 students - as 100 graduating seniors are replaced by only 75 eighth graders - and it could lose another 23 students in 2008-09. The elementary school (K-5) averages 79.2 students per grade this fall. The middle school (6-8) averages 76.3 students per grade. And the high school (9-12) averages 92.5 students per grade. Making staff cuts in the high school - as the smaller classes arrive - is not as simple as making them in the lower grades. In the elementary and middle school, where the district has already made staffing cuts to reflect the smaller student enrollments, fewer teachers increases class sizes but does not cut the curriculum. In the high school, staff cuts need to be made in conjunction with scheduling requests from the students. While the loss of students requires staff reductions, the district also needs to offer a good variety of classes to keep student interest, said Burlingame. This year, the district added college-credit classes - macroeconomics and calculus - to try and keep juniors and seniors at PAHS and from going post-secondary. "It's a balancing act," said Burlingame, "because we want good offerings and to keep kids here but we also need to be financially responsible." The district will continue to try and make any budget cuts through attrition, said Burlingame. That is the district will choose which retiring teachers to replace, thus reducing staff simply by not replacing certain retiring teachers. In addition to opening-day enrollment losses, the district in recent years has averaged losing one student per month (nine per school year) as the school year progresses, added Burlingame. District administrators track students leaving the district, said Burlingame, and they report the enrollment to the school board throughout the school year. Families these days are more mobile than ever, said Burlingame, leading to some of the enrollment fluctuations. Students - with home-school, post-secondary option, open enrollment - also have more options than ever for their schooling. One reason why the district did not do budget cuts this year was that the only teachers who retired were in the elementary school, whereas the enrollment losses were in the high school. Next year, the district could have 89 second graders, and it currently only staffs three teachers in the second grade. A possible addition to the school budget next year would be to add a teacher in the second grade, said Burlingame, which would divide these classes into four sections of 22 students, instead of three sections of 29 students. Five to seven teachers could retire next year, said Burlingame, but the district will not know officially until they submit their retirement letters in the spring. A trend across the state, said Burlingame, is for teachers to continue on the job even after qualifying for full retirement, largely due the need to pay for health insurance. The process for the school budget adjustments for next year is: seeing the audited financial numbers this fall; high school staffing needs for next year after registration in February; projected kindergarten enrollment for next year after the round-up in March; official teacher retirements; and final approval by the school board next spring.